LONGER LASHES for LESS: Best Drugstore Mascara’s! When it comes to mascara, there is truly a tube out there for everyone! Whether you prefer mega volume or are looking for a formula that will make micro-lashes look like falsies, a girl can be pretty particular about what she coats her lashes with. But, if you are anything like me, and go through mascara fairly quickly, than opting for a wallet-friendly formula is the way to go! While I love a luxurious beauty splurge every now and then, it’s not necessary to break the bank for the sake of beautiful lashes. Over the years I have tried everything from designer formulas to drugstore brands, and in my search the least expensive tubes always prevailed. It’s true! In fact, did you know that many designer brands are made by the same manufacturers – in the same factories – as their cost-conscious drugstore counterparts? Thus the only major difference is the price! 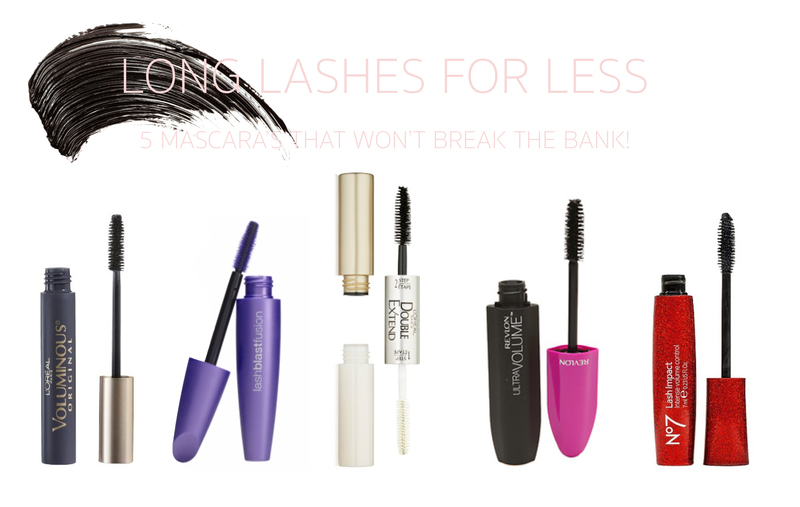 So, without further adieu, here is a list of the top mascara’s for less! 1. L’Oreal Voluminous Volume Building Mascara. L’OREAL’s mascara is richly pigmented, so it clings to lashes making them appear longer and fuller. Give the brush a little wiggle as you work it up for maximum benefit. 2. Covergirl Lash Blast Volume Mascara. LashBlast is one of the most highly rated mascara’s among beauty editors and makeup aficionados! It lengthens, separates, and will leave your lashes clump free! The brush has thick short bristles, which help to maximize volume. 3. L’Oreal Double Extend Mascara. The secret to beautiful lashes isn’t mascara – it’s primer, and L’OREAL’s Double Extend mascara-pimer two-in-one is easily the best on the market! Apply two coats of the primer before applying mascara for thick, lush lashes. I promise it will not disappoint! 4. Revlon Ultra Volume Mascara. For ultra volume try Revlon’s new Ultra Volume Mascara. Its unique brush has both short and long bristles that comb through each lash for a perfectly even application. It leaves lashes long while eliminating clumps! 5. Boots No.7 Lash Impact Mascara. Boots Lash Impact Mascara is a fiber based formula that helps thicken eyelash follicles. This added buildup creates a dramatic, false-lash effect! Simply add more coats until you achieve your desired look! Boots No.7 “Lash Impact” Mascara, $10.99; target.com. For me, mascara has the shortest lifespan compared to any other product in my makeup bag – regardless if it’s drugstore or designer the constant exposure to air causes the formula to dry and crust. I read on Pinterest (follow along here) a while back that you can add a few drops of saline solution (contact solution) to your tube of mascara to make it last longer – and it really does work! Did anyone else know of this little magic trick? When getting ready, I typically use three different tubes of mascara – one super dry, one medium dry, and one wet. It’s a little routine I started doing in college. Until recently, all three were the same product, just different tubes. I use the medium tube for the first few coats and the wet, newer tube for the third, final coat. The dryer tube serves more as tool to comb out and shape my lashes before the mascara drys! If you are someone who uses multiple tubes of mascara, or goes through it fairly quickly, you may want to try adding a few drops of saline to your tube(s). It’s the best money saving trick ever! Also, I’ve teamed up with a few of my favorites to give you the opportunity to win a $450 shopping spree! Follow the directions below and enter for your chance to win a new SUMMER wardrobe! a $450 shopping spree on US! This giveaway is open internationally and runs until 4/15.